the big C-14 and would have no issue riding another for many miles. It is a great machine with a wonderful motor and great two up comfort. With that being said, I have to say that as of this moment the Big Versys is the best sport touring machine I have ever ridden. I have taken rides on many bikes that fit into this genre. I love the BMW RT. I love the look and feel and the ride was amazing. What I did not enjoy was the price tag and the reliability issue that comes into play with owning a BMW. I also love the GS Adventure. Again for the same reasons as listed above I decided on something else. I belong to a local BMW club. I have seen first hand how good and bad these machines can be. The piece of mind and the price tag do not give me the warm and fuzzies. I rode the Triumph Trophy. I really wanted to like it as I had owned a Trophy in the past. I love the triple and I really enjoy having a machine that is unique. You know.. not pulling up to your favorite riding hangout and parking your bike next to 3-4 others that look just like it. The Triumph has character. Riding it was nice but it felt BIG. It was pricey and it just seemed to Goldwingish (is that a word?) for me. 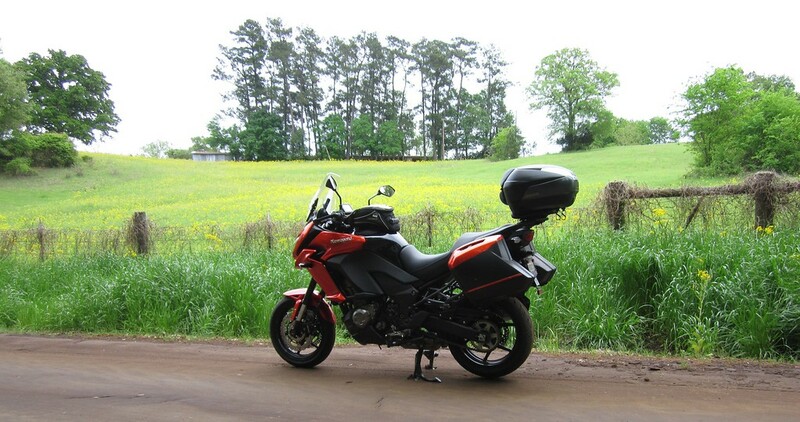 I also wanted to really like the big V-Strom. I had ridden the wee and Jamie and I had some of the best rides on that smaller bike. It was light, looked cool (as cool as a wee storm can look) it was economical and it was just fun. Jamie loved the seat and could ride for hours on it. The motor was good. You had to plan a good two up passing maneuver but it was all good. I went and looked at the Big Strom and after riding it was not very excited. It was a good a machine. It would have done everything well and I am sure it would have been a reliable, fun machine. The only thing was the fact that it stirred no emotion in me. It was plain jane and I was not looking for plain. I wanted excitement. You have to remember that I do a lot of two up riding. I need a machine that is reliable, comfortable, good two up, fun in the twisty stuff and has a powerful enough of a motor to make passing a reaction and not a planned affair. If it were just me doing the solo thing. I would have a Ninja 1000, Ninja ZX-14 or a Ducati Multistrada (still the sexiest bike around). I would go for more sport and more of an aggressive feel. Trust me, I am not complaining. 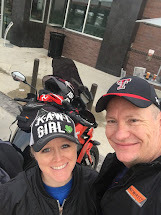 I love the fact that my wife loves to ride. I am a lucky man indeed. So with all of that out of the way let me tell you about my ultimate sport touring machine. 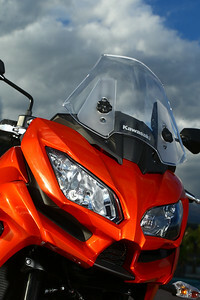 I had heard rumblings that the guys in Japan and at Kawasaki were contemplating bringing the Big Versys to the states. I had followed the boards on the previous versions and was very interested in the bike. Even in the older version, I loved the motor and the bike itself. The looks fit into the unique category for me so I was OK with that as well. Then I saw rumors that the front end and look would be changed to resemble the Ninja. I was now very excited. I have always loved the Ninja look and I could just imagine what it would look like on the Versys platform. I started looking at the forums and lurking around. I wanted to see what current owners thought of the Versys. I was not disappointed. The board was full of enthusiastic riders who loved their machines. I started to plant the seed with my wife. Explaining that the C-14 was rounding 65K and that I was looking for something a little more up to date. She loved the C-14 so I had to tread lightly here. 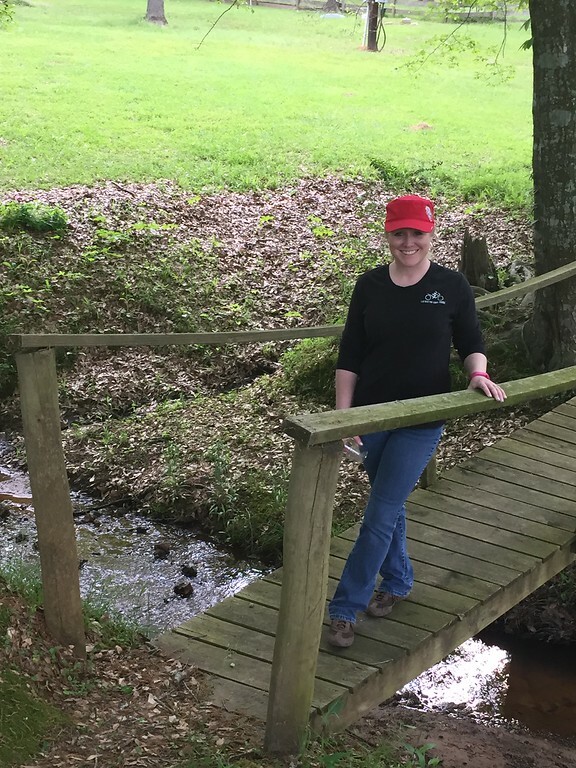 I wanted her to be happy and I wanted her to continue to be excited about riding. 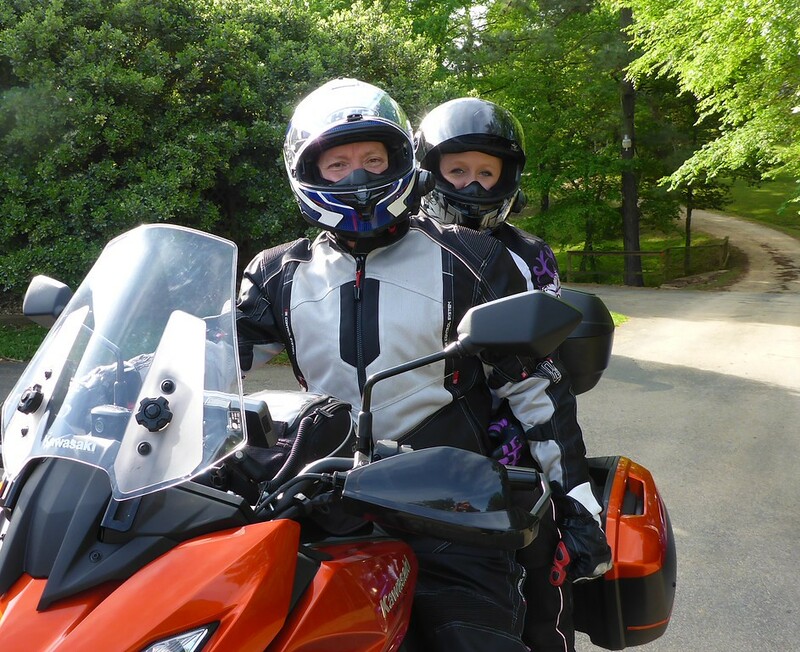 I told her that when they came to the states I would like to test ride one. I walked into our local dealer on a Friday and guess what? they had just gotten one in. It was beautiful, it was orange and even if I did not want to admit it, it was going to be mine. I spoke with the owner of Plano Kawasaki and she said that she would hold onto the bike for the weekend. Jamie and I could not ride it until Monday as Jamie was feeling a little under the weather. True to her word, the bike was gassed up and ready to roll on that Monday. She told us to go ride it and don't worry about being back in some allotted time frame. We took advantage of that and put a good 30 miles on the bike before returning with ear to ear smiles. Well the rest is history. only 5'2 but still after a long 400-500 mile day her knees would let her know that she had spent a long day on the bike. This would not be an issue on the V. We also loved the power. The V has less horsepower than the C-14 but it also had less bulk. About 150lbs less. It made passing and high speed maneuvering a breeze. 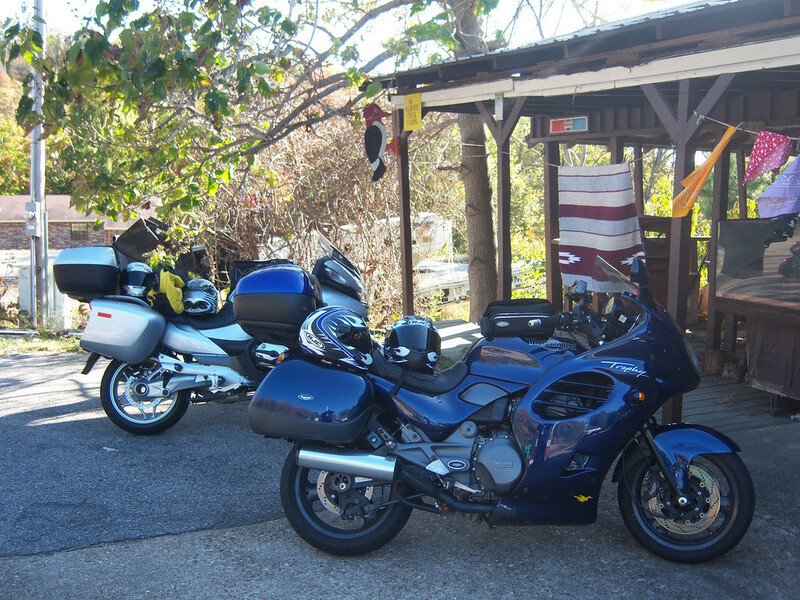 The Versys was also much easier to handle in slow maneuvering areas, like parking lots. The weight loss was very apparent in parking lot maneuvering and made these tasks seem easy and flawless. Here is a breakdown of the Versys from our experience to this point. Kawasaki is known for their reliable, powerful and great sounding motors. The Versys does not disappoint in this area. The power plant is smooth, strong and the torque is tractor strong. 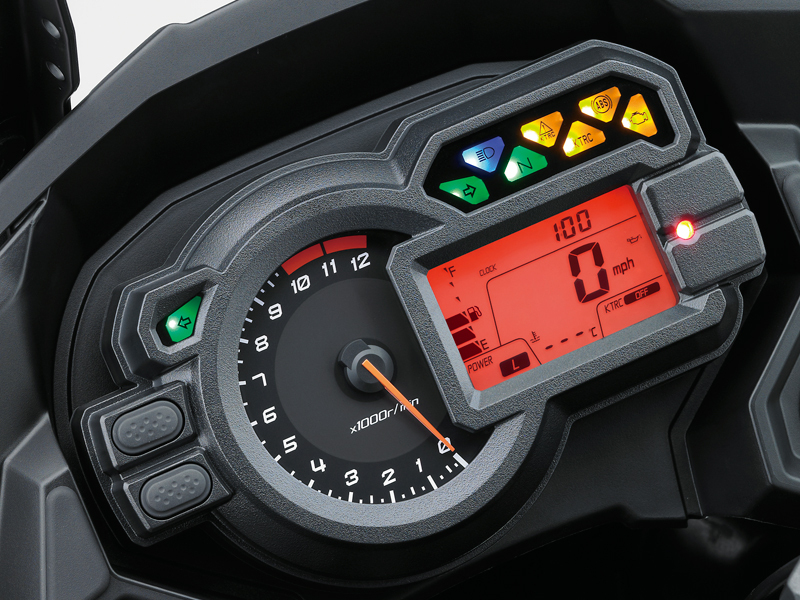 It make plenty of usable power and if you get on it, the motor reminds you that it is a sportbike in adventure clothing. This motor provides more than ample excitement. It is tuned for spirited riding as well as the dreaded slabbing when needed. The motor does everything well. Nothing sounds better than this bike when you are pushing 7000-8000 RPM. The sound is truly intoxicating! You had better be prepared when pushing the rev limiter. This bike is fast and fun. Nothing else can be added. the motor is EXCELLENT! The bike is chain driven, this was not an issue with me when considering the bike. I have ridden chain driven bikes for years. I love the shaft drive thing, but it is not a deal breaker at all. The transmission is seamless. It shifts easily and the clutch takes very little effort. In fact the shifting feels a little too good as I am used to a solid thunk when changing gears. The slipper assisted clutch makes spirited riding a lot of fun. The drive train and clutch are world class and 2nd to none. depending on your riding style, size and comfort level. I have left the front alone, but have adjusted the rear many times. The rear knob allows for easy adjustment. It allows me to alter the ride when Jamie is on board, when we have the bike fully loaded or when I am out just riding solo. 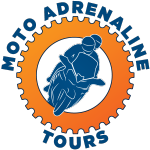 The travel of the suspension allows for a spirited run without having to worry about dragging any hard parts. The center stand has hit a couple of times in very aggressive cornering two up when hitting some bumpy pavement. Other than that it is not an issue. 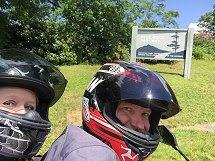 We are taking her to Arkansas in a couple of weeks and we are excited about taking the twisty spirited riding up a notch. Stay tuned as I will report on that in the ride report. The traction control is very good. There are 2 power settings. Full and Limited. Full allows 100% of the power plant to be available at the twist of the wrist. Limited takes this down to 75% There are three levels of traction control 1-2-3 with 3 being very muted and used mainly for rain. You can turn off the traction control if you would like. I ride with it in Full 1 position and it is a blast. Be careful as the bike will pull the front wheel pretty easily with just an abrupt twist of the wrist. Fun indeed.. just be ready! pillion does not get moved around as well. In the colder months of the year a larger screen would be nice. There are already a number of after market screens available. I will be looking at one of those before next winter. At this time I am looking forward to the cooler ride of the shorter screen and less wind protection. The C-14 was very protected, but almost to a fault. For those of you that have ridden in the Texas summer heat, it can get HOT! UNBELIEVABLY HOT! Riding on the sun hot! So the fact that the Versys lets more wind find its way to the rider might be a very good thing. I know for a fact that the windscreen that is adjustable will be in the lowest position here soon. I did not get the heated grips when I bought the bike, but will be getting that option installed as well before next winter. I had bar risers on the C-14, but again I do not think I will need to make that adjustment on the Versys. I sit in a great position, my hands and arms are a good fit and just perfect for easy counter steering. 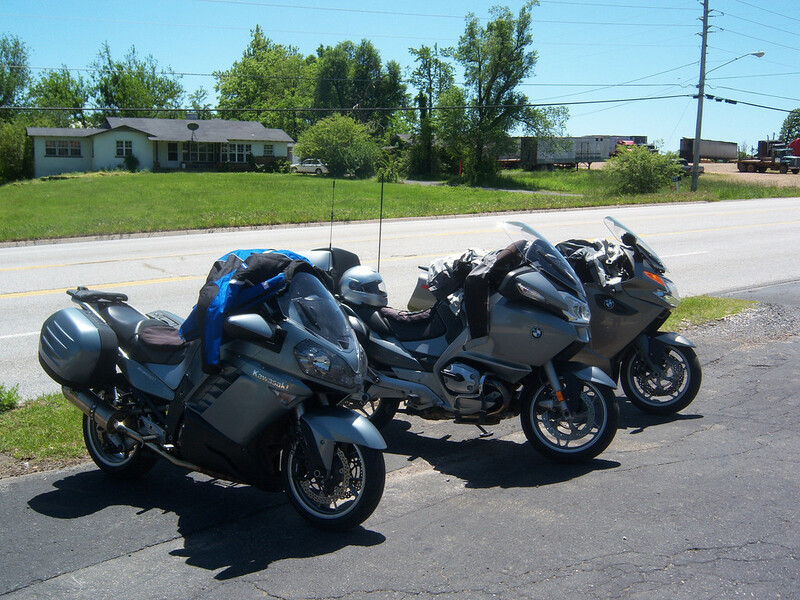 I am really looking forward to being able to spend a few hours ripping up the curvy roads in Arkansas. Two up comfort is huge with us. We put a lot of miles on the bike and it is essential that the two up comfort level of the Kawasaki meets or exceeds that of the C-14. to my surprise it surpasses it. 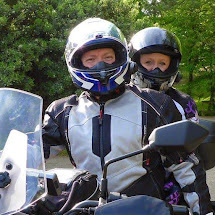 My wife wrote a little post concerning her thoughts on the bike form the pillion perspective. You can read that here. Some say there is a buzz in the motor around 2000-3000 RPM. I can feel it a little but after riding the C-14 it is not even something I think about. The motor has been rubber mounted and I hear it is much better than the previous models. I have read where some people have complained about the "buzz". I don't get it but again I came off the C-14 that was a tad buzzy as well. This is a non issue to me. turns into corners well and it has a good feel. The front end losses a little feel when cornering hard. I think that this will go away once I get different tires on the bike. You can lean the bike over with little effort and the bike feels solid. The Brakes do a great job of slowing down the rig. I have went and played in a big parking lot with the ABS. This is the first bike I have owned that has the option. It is awesome. I latched down hard a number of times and it stops with ease and with little violent reaction. You can trail brake when riding aggressively without worry. Two up it is amazing how well the bike handles. 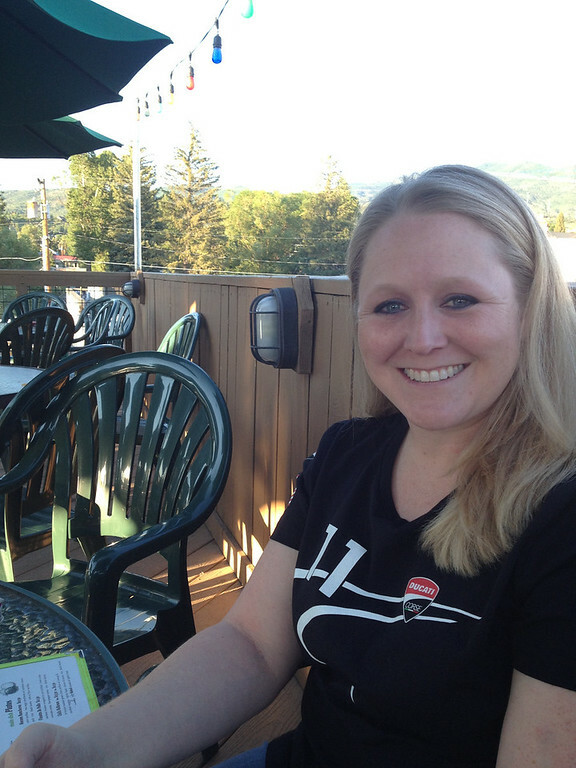 My wife truly understands the meaning of sport touring. She loves a spirited ride, taking corners with plenty of lean angle and begs for more. There is a reason I love that girl. The Versys handles all of that with ease. The bike is by far better than my talent level, and without sounding cocky I think I am pretty damn good at the riding thing. Thumbs up for the handling! Now we get to the first thing that I feel is subpar with the Versys. That is the tires that come on the bike. The Bridgestone T30's are decent tires, but this bike deserves better. The feel of the tires are decent, but not great. They hold true and do not slide around until you start to really push it. The front feels light and a does not inspire a great amount of confidence when playing hard. The rear feels and sticks well but compared to the PR3's I had on the C-14 they are not even n the same league, I have 3650 miles on the bike and the rear tire will be toast with just over 4000 miles on the clock. The front is cupping a little but nothing awful. I know we ride two up and at times pretty aggressively, but I was hoping to get 6000+ out of the rear. I just ordered Michelin PR4's for the Versys and will have them on the bike for the Arkansas trip. I will do a little write up about them when we return. Yes I am biased, but I am also honest. This machine is amazing and I am so glad that we made this purchase. 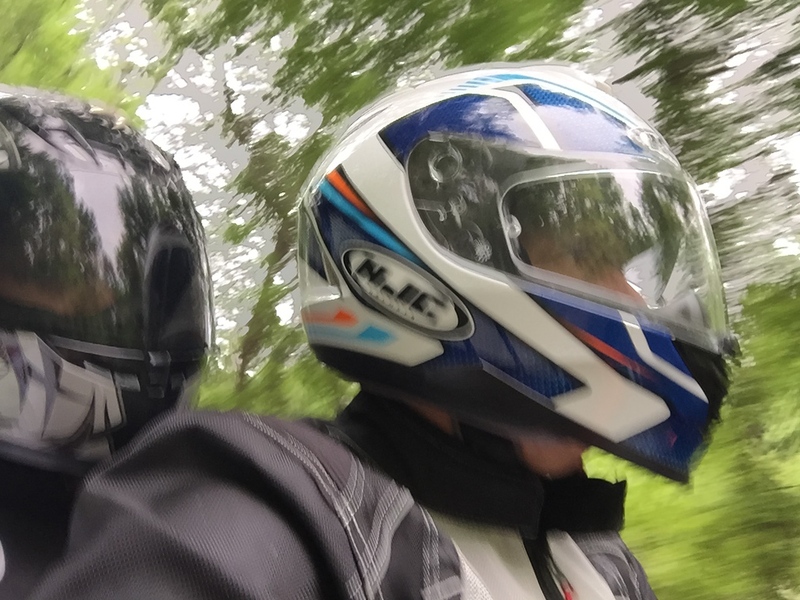 It fits everything that we like to do when it comes to motorcycle riding. It will eat up miles, it is fun on a Sunday afternoon food run. It is ready to tackle the twisty roads without a hitch. It has the capability to take the two of us on a 5-7 day journey. It does it all and it does it all very WELL!. The bike is ready to go and I think we have done all of the mods that we plan to do for awhile. We added the Zumo 660, the 12V adaptor and the SHAD top case. We will add a larger wind screen and heated grips before next winter. The bike is ready to ride and we are going to do some of that in the coming months. We are headed to Arkansas for a 4 day mothers day run in a couple of weeks. 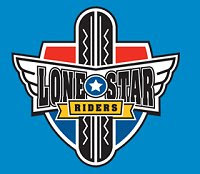 We will then do some weekend rides before heading out for a 12 day journey to New Mexico and Colorado in July. 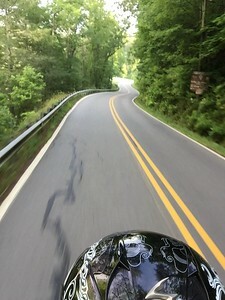 Keep checking in on the blog to see the ride reports and all of the pictures we take on our trips. Extremely good write-up on your new steed. It looks great and I know the motor will be fun (I've ridden a Z1000SX). 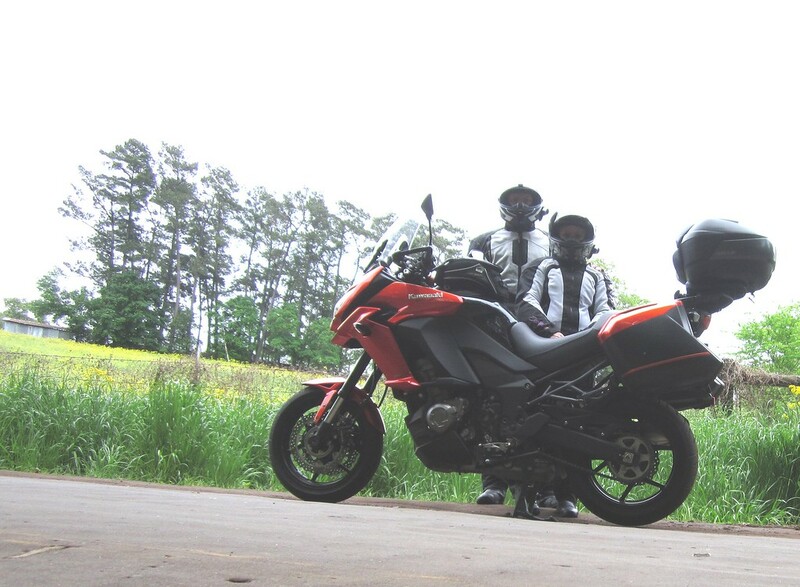 I have a C14 (with 124,000km on it and I'm still in love with it) and a V-Strom 1000. I really understand what you are saying about comfort levels on Adv styled bikes. I've ridden a number now (including a S10) and think that Adv bikes are amongst the most comfortable and easy to ride bikes available. They also handle poor roads better than any other style of bike. I'm not planning on selling the Connie anytime yet but will be changing the Vee (hopefully this year) for something else in the category. 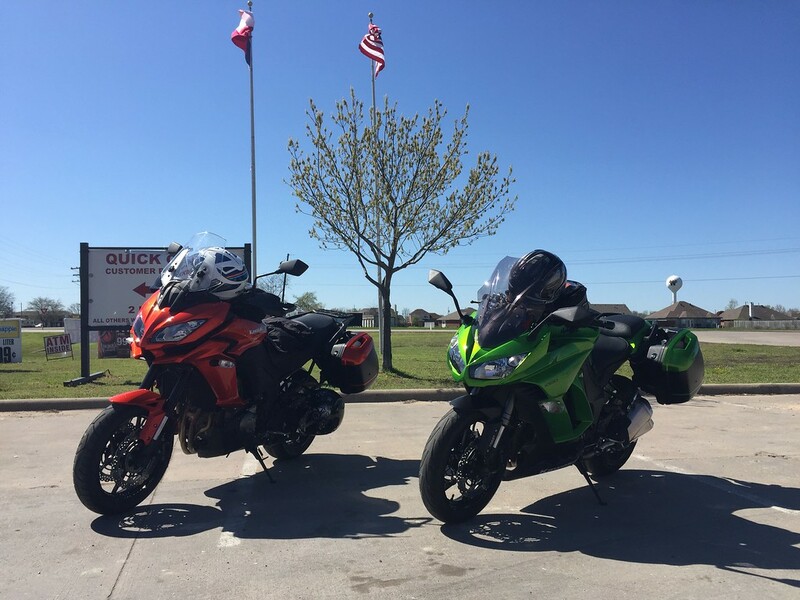 Love your review and as a fellow 2015 Burnt Orange Versys 1000 owner, I have to agree with your assessment. 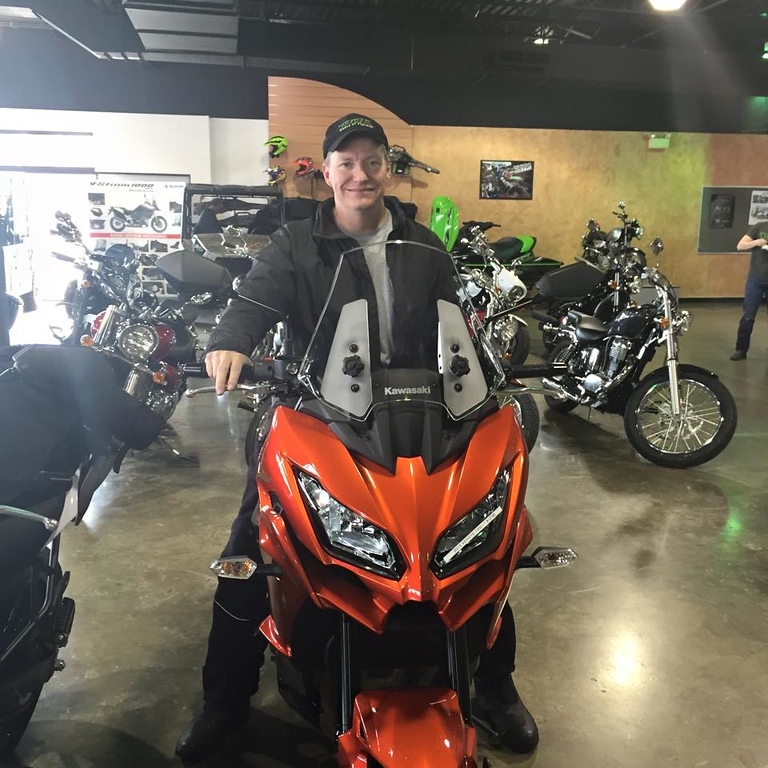 I traded a 2012 Ninja 1000 for my Versys a few weeks ago for the sake of my bad back (I refuse to quit riding!) and boy oh boy do I love the ride! The seat is the most comfortable sport seat I've ever been on, the ergonomics are wonderful, and I still get my awesome 1043cc engine. Like you I'm going to go with PR4's when the T30's wear out. Although I've found the T30's to be acceptable, I had PR3's on my Ninja and I have been spoiled by the PR's. Have fun in Arkansas...can't wait to see the ride report!